In certain workplace conditions it is almost impossible to reduce noise at the source but it is not even bearable. 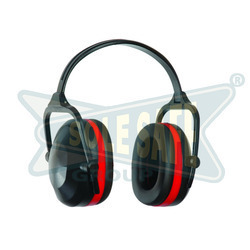 In such workplaces workers wear hearing protectors to decrease the amount of noise reaching the ears. The choice of hearing protectors depends on level of noise comfort and the suitability of the hearing protector for both the worker and his environment. 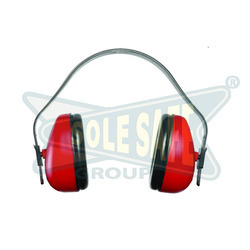 So we provide our users wide range of ear muffs and ear plugs which provides the desired noise reduction. 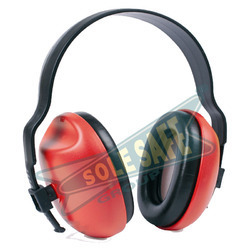 With more than two decades of experience in the field of Industrial Safety Products, we have emerged as a respectable leader for the supply of Ear Protection Device.Our offered Ear Muffs are meant to protect ear from loud noises. Ear protection muff consist of sound-attenuating material soft ear cushions that fit around the ear hard outer cups and are held together by a head band. I. The ear muff is made out of impact proof PP for rugged use. II. It is fully dielectric and safe from electrical hazards. III. It consist of Polyurethane / liquid filled ear cushion for comfort and to ensure maximum attenuation. IV. Adjustable cushion padded head band rotating 360 deg. with chrome plated springs. V. Available with ABS plastic head band which gives strength to muff. VI. It is lightweight attractive and durable. VII.This This Light Weight Ear Muffs Conforms to IS 6229 and DTP. 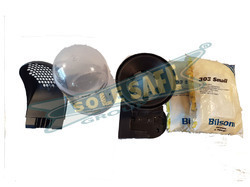 Our product Safety Ear Muffs was developed keeping in mind the safety of people working in manufacturing plants and indoor or outdoor work sites. New models of this Noise Protection Wear keep developing to produce higher quality products without cutting corner. Feature Optimal design, and quick calibration. We are among the prestigious names in the industry, engaged in offering Ear Protection Wear to our valuable customers. The offered Noise Protection Wear is designed with vast domain expertise of our professionals and are highly appreciated for their optimal functionality. Our Ear Muff delivers optimal attenuation of harmful noise frequencies thus useful for people working in extreme noise environments.head band a hard hat mounted muff a neckband. 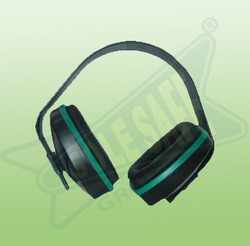 The safety ear muff has padded foam headband which minimises pressure on the head. I. Super Performance 3 - position earmuff for people working in extreme noise environments. II. It is especially designed for low - frequency noise. III. It can be worn with other Personal Protective Equipment. IV. Quick - click height adjustment that stays in position during use. Ear Safety Device is known for its optimal design, and quick calibration. Usage Labours, workers and inspection officers. We are known for creating a wide range of innovative and sustainable products for the industrial markets among which Ear Plug stands on its design, strength and reliability. We provide ear plugs made from soft and light foam which fits easily in the ear canal allowing them to seal the harmful noises dust or any hazardous materials thus giving protection. This industrial ear plugs are available with cords which are securely and cleanly attached to the ear plugs at both ends. I. The ear plug is made out of soft polyurethane foam which takes the shape of ear and reduce the level of noise thus giving protection. II. It consists of 3M 1110 corded ear plug. III.Foam Ear Plug is recommended for labours, workers and inspection officers to use while performing their duties at the site. IV. These Reusable Ear Plugs are finely finished and are known for their ability to provide optimal protection. • Special ABS Ear Cups for Durability. • Soft cushioned pads for good seal against nose. • conforming to EN 352-1:2002. • Recommended Area: Airports, Excavation Equipment, Generators & High Frequency Welding. • Soft cushioned pads for good seal against noise. Application Industrial, Agricultural & Construction Machinery. • Plastic Head Bands Folds for dust free storage in pocket or a bay. • Recommended Areas: Industrial, Agricultural & Construction Machinery. • Light weight Plastic Dispenser. • Used as a table top unit. • Allows easy access to the user. • Can contain 300 pairs at a time and be easily refilled. Now Companies have started adopting increased safety measures since it has become mandatory to follow safety protocols. Audits for Safety Ear seal take place to check their conformance to safety and quality standards set by government and testing bodies. This Ear Seal is designed for protection against extreme noises by sealing out noise at industrial workplaces. This ear safety devices includes removable cord & free storage case and are washable and reusable. I. It is very effective noise protection equipment which is tested to IS 9167 (1979) and IS 6229 (1980). II. It is most durable and can be reused for 6 months. III. It is manufactured from soft pliable and sturdy synthetic rubber. IV. It is very light in weight and can withstand temperature from -25 deg. C. to 100 deg. C.
V. Most comfortable as it has smooth surface. VI. Std. size: Fits all. VIII. Reflects sound waves very effectively. IX. Packed very attractively with reusable container. This Safety Ear Plug is compact and light weight so that it occupies less space and becomes easy to transport. To keep up with growing demand of Ear Cover, we keep adequate stocks at any given time. We are one of the prominent names in the industry, offering Ear Protection .It offers a highly accessible source for ear plugs used for hearing protection. Ear plug dispenser is reliable user-friendly and ideal for factories and process industries that have zero tolerance for packaging waste. We offer broad selection of Ear Plug Dispenser for construction, chemical, food service, metal, cement , marine and other industries. We study the market demand for Ear Plug Accessories regularly and keep optimum stock levels.